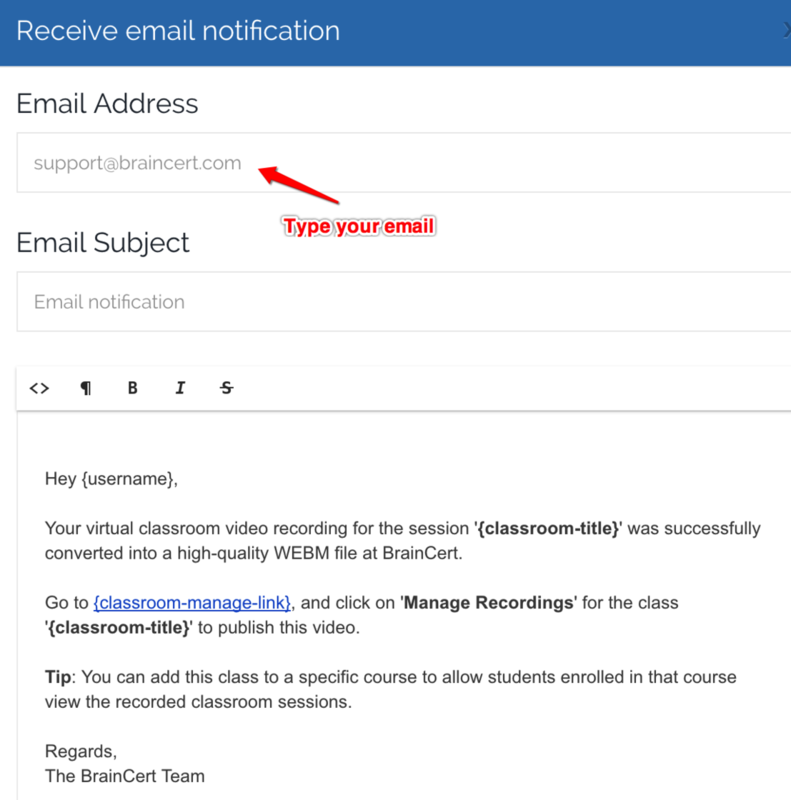 Virtual Classroom API customers can setup email notification template when recording is available and enable webhook to ping your website URL when recorded file is available. This feature is available in your API dashboard. Once recording is available, you may want to post process this information at your end for analytics or dashboard data. For this specific reason, we've also introduced webhooks. Recording webhooks solve these problems by letting you register a URL that we will notify anytime a recorded video is available in your account. API endpoint automatically posts parameters such as &roomId=123&recordId as part of the URL, so you can process this data further at your end. Click on "Recording notification" left nav link and select default tab "Recording Webhook". Now, type the target URL for receiving webhooks and save changes. Make sure the URL you have setup is capable of receiving and parsing parameters posted. For example, PHP file may use file_get_contents('php://input'); to receive parameters posted. Click on "Recording notification" left nav link and select tab "Notification" to setup your email notification template. Turn the slide to 'Yes' position and save your changes. You can turn off email notification anytime by turning it back to "No" position and save the changes. When you edit the email template, you can see that your account email is populated as the default "To" address. You can change this anytime to a different email address. The template can be easily customized with variables or input your own custom text.